The 4300 block of Warwick holds an important place in Kansas City history. When well-known civic and business leaders moved into these large homes between 1900 and 1915, they helped spur a movement to the newly-developing south side. Midtown has a number of distinctive streets: some characterized by their commercial importance; some for their grand residential apartment hotels; and some for their classical turn-of-the-century architecture. A 1907 Tuttle and Pike map of block. Warwick Boulevard, clearly one of Midtown’s most important thoroughfares, played a unique role in Midtown’s development. Few other streets attracted the number of wealthy and well-known citizens. As they hired prominent architects to design new homes on Warwick from 1900 to 1915, their confidence in the area convinced others that the new “south side” suburbs were where Kansas City residential development was headed. As part of our Uncovering History Project, the Midtown KC Post is taking a look at the 1940 tax assessment photos of each block in Midtown. This week we’re focusing on a block from Warwick to McGee, from 43rd to 44th. (Many people seem confused by the tax assessment photos, which all include a man holding a sign. Here’s the story behind them). A look at the early residents of one block of Warwick, from 43rd to 44th Streets and east to McGee offers a glimpse of its role in history. The block is on the local historic register along with other parts of the Southmoreland neighborhood. 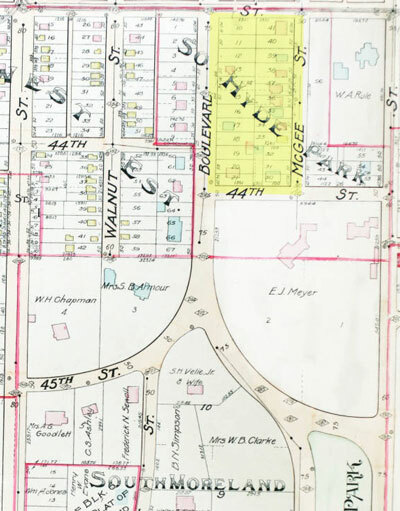 A 1907 map shows the large tract of land owned by August Meyer just south of the block. His large mansion is now part of the Kansas City Art Institute. Meyer, president of the United States Zinc and Metal Company, was also the first president of the Kansas City park board. His close friend William Rockhill Nelson lived to the east on the site of today’s Nelson-Atkins Museum of Art. 4315 Warwick: George G. Wright, a land dealer and president of the Associated Land Company. 4325 Warwick: O. V. Wilson and his wife Ella were important business and charitable leaders and he was one of the founders of the Ryley-Wilson Grocery Company. 4320 McGee: John A. Sargent, vice-president Central Coal and Coke. 4328 McGee: Phillip P. Perry, music publisher. 4334 McGee: Orsen Hansford Swearingen city councilman in 1899 and a state representative from 1911-15. 206 E. 44th: Benjamin C. Christopher, founder of a grain dealership. The slideshow below shows all of the homes on the block, each one distinctive and well-built, as they looked in 1940. Several of the homes are gone now, but the streetscape has remained relatively unchanged for more than a decade. Mary Jo, do you know when the Wilshire Apartment bldg. was built? It is so cool and “old-looking”. It’s in 4500 block–or 43 or 44–of Warwick. 4316 McGee (11-255-4 in the slideshow) was built and owned by William F. Ingham, who owned a lumber business, as I understand it. The first house shown appears to be 4300 McGee – now a vacant lot following a third floor fire many years back. About 50 years ago I shared a 3rd floor apartment with a friend while we attended the Kansas City Art Institute. Family members who owned the house lived on the first floor and (I think) there were 3 or 4 sleeping rooms (with share bath) on the 2nd floor. Unlike some other area rentals this was a peaceful, quiet building. WOW this is a wonderful article!!! I live in the home at 4155 Warwick right across 43rd street from the homes in the block referenced in your article, and have been very much wanting to learn about the history of these beautiful old homes! Do you have any info on my block? My husband’s parents bought our house several years ago and we live on the 3rd floor in one of the apartments it has been split up into and we rent out the other 3 apartment units that it contains. I would LOVE to know what the original home looked like or get any more information that I can, I can see from the photos of the other homes that our home fits right in and looks very much like some of the others on the block, with the red brick exterior and wide stone front porch. Is there any other information that can be obtained about it? It would be greatly appreciated!! !